LED Undercabinet Lights - Two Colour Options. The use of value for money components is important on any project. Nobody wants to spend extra cash without getting something in return. But getting the very best product without paying a premium is the best of both worlds. Simply put there is no product on the market that outperforms this product AND is such fantastic value. Inside the fixture is an array of 26 SMD LED chips. The diffuser over the top is now frosted. This gives a wide spread of light which means that when used in even shallow spaces you get a good even illumination. There is no heat from the lamp to scorch furniture, ideal if you are replacing halogen lights recessed into the cabinets. Provides a wide distribution of light - all diodes have 160 degree beam angle. They give the 50% more light than a 20w tungsten halogen light (380 lux at 0.5 metres and 100 lux at 1.0 metre) and cost virtually nothing to run. 5000ºk (cool white) light output enhances the colour of white, blue, black and silver materials. 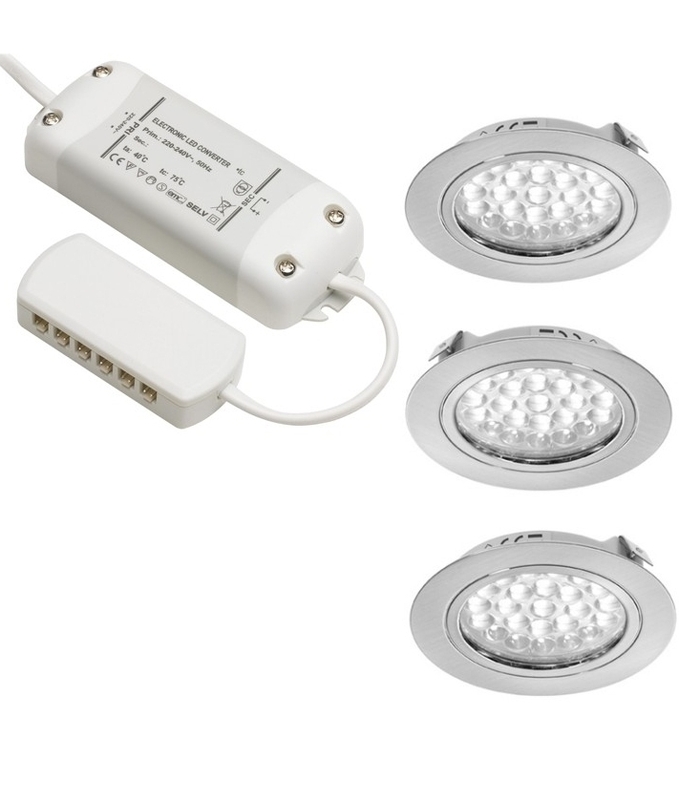 These high output LED under cabinet lights are suitable for recessing into furniture. This makes them suitable for flyover pelmets and for use in the top of kitchen cabinets. They can be used on the underside of cabinets only if you are competent enough to cut a rebate 10mm deep into the carcass with a plunge-cut router. The lights are made from stainless steel with a brushed finish. They have a clear glass cover pre-wired with 2400mm flex. The lights are not sold in kits this gives you the flexibility to position lights where desired and use whichever 12v power supply suits your needs. Hand sensor which allows you to turn the cabinet lights on/off and dim is available. This can be found here for motion sensor or here for touch. Can I use these in a bridge unit to illuminate my kitchen sink. ? There is no IP rating mentioned. The bridge or flyover is going to be at least 60cm from the sink so no IP rating is required. These LEDs would be perfect for your needs. I note that these units are supplied with leads and plugs but I cannot find reference to their length. Is it possible to shorten the lead and refix the plug? The heads have a lead that is 2400mm (8 foot) long. The flex is similar to bellwire and can easily be reduced in length. These are sold individually, To get the picture shown, you would need to order 3 lights and a driver. Can the 15w power supply run less than 3 lights? The reason for asking is that I would like to over-specify the transformer, in case I add more lights later. This transformer uses a constant voltage driver so will not over volt the LEDs. Using less than 3, should be fine. I see from the answer to the above question ¬Why don````t you sell them in kits?¬ You say that the fixtures have a lead with a plug, which just pushes into a socket. I want to connect mine to a light switch instead, can I just cut the plug off then wire into a light switch? The under cabinet lights have leads with plugs that push into the power supply, you would wire the power supply to your mains connection. What kind of guarantee do these lights and the dimmer sensor switch come with? All products are guaranteed to be free from defects for 12 months from purchase date. The LED lights have an average lamp life of 15,000 hours plus. When used for 4 hours a day, 365 days a year this works out as over 10 years so they are designed to last for a very long time. How many lights are in a pack, and is the transformer a separate item? For your very best led under cabinet lights which transformer do I need? Is the one in the picture part of them? Look at the bottom of the listing. Under the LED light we have listed the power supplies. If you are unsure please call us, we`ll be happy to help. How do I change the bulb and what type of the bulb is it? This fitting uses a long life LED light source. These are built into the fitting so not replacable but offer a lifetime of around 20,000 hours, a lot longer than regular incandescent lamp. I want to recess these into a shelf that will be thicker than the light fitting body is this possible? What is the equivalent light output of these when compared to halogen G4 lamps, are they the equivalent to or brighter than a 20 watt? These fixtures have spring clips at the side so will fit an aperture in any material with a minimum depth of 5mm. So will fit pretty much any ceiling, kitchen cabinet or shelves. Just be sure to cut the hole the correct size - don`t cut the hole too big! These LED lights give the 50% more light than a 20w tungsten halogen light (380 lux at 0.5 metres and 100 lux at 1.0 metre) and cost virtually nothing to run (0.8 watts per head). Can I extend the wires to put two lights on the other side of the kitchen? And will the sensory switch control all lights? Yes you can extend the wires as required and use the sensor to control them all. 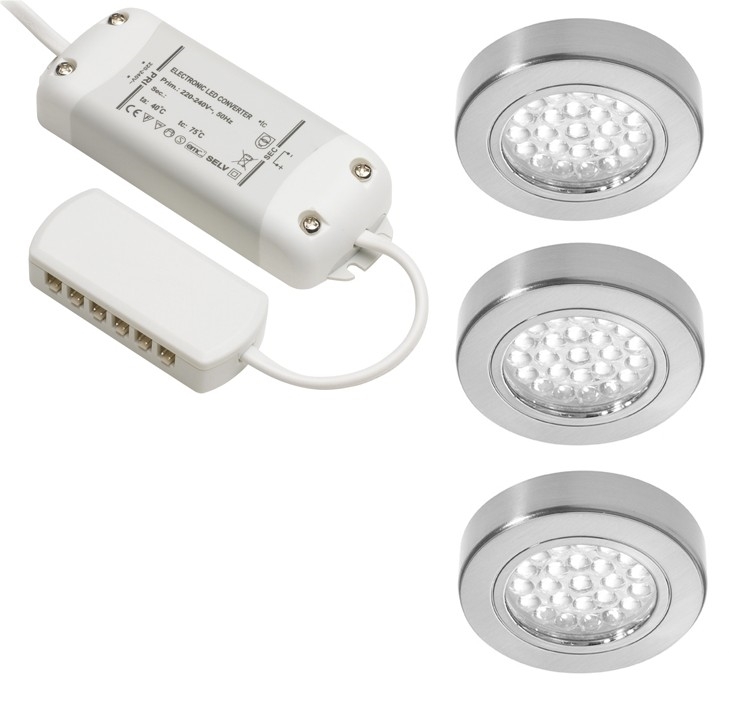 We offer these lights in both recessed and surface mounted options. Obviously the surface mounted versions are easy to install. Warm white LEDs work well with warm tones i.e. wood while cool white work well with granite tops with silver flecks of colour. The fittings have a projection of just 1mm. Providing you have space for wiring and power supply there is not reason why they would not work in the pelmet. We would not recommend these for a bathroom as they are not IP rated, a minimum of IP44 is required in Zone 2 of a bathroom. Why don`t you sell them in kits? We don`t believe one size fits all. Due to the complexity of kitchen designs, users may want one fixture under the cabinet on one wall and 7 fixtures on another wall. Selling these as components gives you the full flexibility you require. All of these are easy to install - the fixtures have a lead with a plug and this is just pushed into the power supply. Are these as bright as halogen versions? These LED under cabinet lights give exceptional performance and are brighter than any halogen versions. They also give very little heat.